The Sambo Martial Arts form is a combination of Japanese Judo Techniques, Wrestling /Grappling Submission holds and also a few choking attacks and was developed by the Russian Army at around 1930. This very modern fighting style is used in a few video games, especially in fighting games as well. The probably first Sambo using video game character is Blue Mary from the Fatal Fury and later the King of Fighters games by SNK and Bayman (later Leon as well) from the Dead or Alive games. 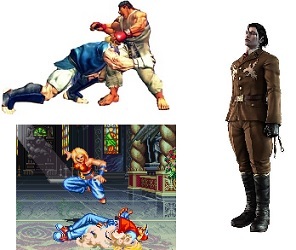 Later following at around the same time were Sergei Dragunov (Tekken 5 Dark Resurrection) and Abel (Street Fighter IV) . There are also Cyrax and Sektor using it as style in Mortal Kombat Deadly Alliance & Mortal Kombat Armageddon. They are all using the Combat Sambo which is the style used by Russian Army Units.